[Episcopal News Service] Many Episcopalians vowed to fight to preserve the federal immigration policy known as DACA, or Deferred Action for Childhood Arrivals, and to support the 800,000 “Dreamers” it impacts, after the Trump administration announced Sept. 5 an end to the program. The administration announced that it would phase out the DACA policy, giving Congress six months to act legislatively to save the program that allowed qualifying undocumented immigrants who came to the United States as children to remain in the country. 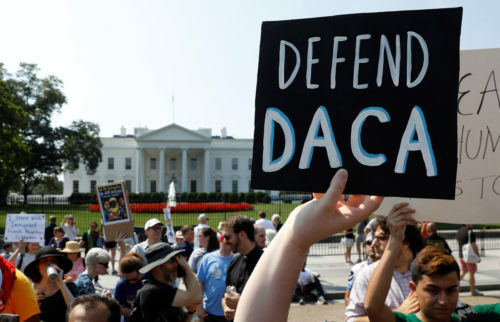 President Barack Obama instituted DACA in June 2012 by executive action, giving so-called “Dreamers” the ability to receive a renewable two-year period of deferred action from deportation and eligibility for work permits. For the Rev. Nancy Frausto, associate rector at St. Luke’s Episcopal Church in Long Beach, California, in the Diocese of Los Angeles, and a Dreamer, the Sept. 5 news was terrifying. Frausto, 33, who came to the United States at age 7, said she and her brother “are very proud of our Mexican heritage, but we know no other country. We have worked so hard to achieve our dreams, and it all could be taken away in a second. Frausto was ordained a priest in 2013; she grew up attending All Saints’ Episcopal Church in the Highland Park neighborhood of Los Angeles where she was a popular youth leader. Because of her undocumented status, she was unable to apply for financial aid for college, so the church created a scholarship fund and assisted her education. In 2013, she was named an Episcopal Church Foundation Fellow, and she is popular at conferences for speaking about “scrappy” or struggling churches. She also serves as a consultant evangelist for the Presiding Bishop’s Office on Evangelism. The Episcopal Church’s presiding officers issued a statement after the Trump administration’s announcement, vowing to work for immigration reform and to support Dreamers like Frausto. The complete statement is here. The Episcopal Church’s Office of Government Relations, as well as its Episcopal Public Policy Network, has long been engaged in advocacy for “a humane and proportional immigration system,” based on the General Convention’s stance on the issues involved. The office has a collection of resources for advocacy and action on immigration policy, as well as information on current policies and proposed legislation. In Los Angeles, members of Episcopal Sacred Resistance, the diocesan task force on immigration, said they would join a demonstration at 5 p.m. in the city where thousands were expected to protest the decision. Just last week, they had rejoiced at the Aug. 30 release from detention of Romulo Avelica-Gonzalez. Immigration and Customs Enforcement (ICE) agents took him into custody in the presence of his teen daughter, after he had dropped another daughter off at school. The case was widely publicized, and after a six-month detention, he was returned to his family. Avelica-Gonzalez, 49, has lived in California for 30 years and has four U.S.-born children. The nation’s highest immigration court vacated a final deportation order on Aug. 10, and his case will return to a local court for another hearing. “In the Episcopal Diocese of Los Angeles, home to one of the largest Immigrant populations in the nation, we bishops reaffirm the diocese’s continuing commitment to Dreamers and their families and call upon the president and Congress to heed the call of a clear majority of the American people and guarantee the status of these deserving persons once and for all. Just as the body of Christ is strengthened by unity amid difference and diversity, these Dreamers, these amazing Americans, make our country stronger each day,” Bishop J. Jon Bruno, Bishop Suffragan Diane Bruce and Bishop Coadjutor John Taylor said in a statement. Immigration activists will continue to press for justice, said the Rev. Mike Kinman, rector of All Saints Church, in Pasadena, California. “We know how to fight this and we’re going to fight it. It starts by doing what we’re doing today, taking to the street and saying, not on our watch, especially here in California, where about 223,000 of the 800,000 people who are Dreamers live,” he said of the demonstration planned for La Placita Olvera in Los Angeles later in the day. “From a nation that has for centuries stolen resources from Central American nations, pauperizing them and leaving their citizens little choice but to follow those resources north in search of survival, this action is particularly cruel and deeply ironic,” Kinman added. “It seems [Trump] has so little political capital left, why would he spend any of it on something that seems to me to have no upside?” Leslie said. Leslie, who recently retired as archdeacon of the diocese, said she also planned to be at the demonstration in downtown Los Angeles and she vowed to continue to fight for just immigration reform. Avelica-Gonzalez’s release doesn’t make up for the other people, she said, who are being unfairly held in Adelanto detention center in Los Angeles. However, each time activists are faced with a new challenge “and we gather together, it gives me hope,” Leslie added. “Now that the president has acted, we will turn our attention to Congress,” Budde said outside the White House. Dreamers are part of the U.S., she said. “I want you to know that you belong here. We love you; we are so proud of you; and we need your gifts, talents and hard work to help make this country live up to its greatest ideals. As for Frausto, she admits to struggling against “being in a very dark place now.” She was able to work in the church because of DACA, after previously fearing she would need to leave the country for at least 10 years. — The Rev. Pat McCaughan is a correspondent for the Episcopal News Service. She is based in Los Angeles. Demonstrations, protests and leftist rage are not the answer. We must compel the Republicans and the Democrats in Congress to act to preserve the intent and effect of DACA and to finally pass meaningful, just immigration reform. As Republicans and Democrats alike, we need to stop voting for feel good ideologues and start voting for leadership! President Trump was correct to insist that Congress make laws concerning immigration. The previous president said on several occasions that DACA was NOT under the purview [legality]of the executive branch and yet the former president issued an executive order anyway, in violation of the U.S. Constitution. Personally, this topic is difficult to discuss since people who had no “say” in coming to the U.S., were brought here illegally and may [not will] be affected if Congress does not act the way Congress should act. Congress simply did not want to take up the matter of illegal immigration with children involved. Shame on Congress for abrogating their duties. Right on and, further, the Episcopal Church should be responsible and only support a proper legal resolution to this through legislation, as the US Constitution prescribes. This means pressing one’s house and senate representatives to pass a bill; not reinstating DACA, which would be overturned by the courts in time anyway. DACA is an illegal and unconstitutional Executive Order by President Obama, which he knew was illegal and publicly stated so before he decided to do it illegally anyway. This seems to be as good a solution as there is for this situation. We are a nation of laws and not of unlawful actions. Like we should deal with all of Trump’s illegal and unconstitutional Executive Orders? If Congress will ever get its act together and actually pass some legislation, perhaps we will get real and meaningful immigration reform. Taking out your anger on children who had no say in coming here, and who know only this country as their home, is contrary to the American spirit and to the welcoming gospel of Jesus. to;susan russell…sorry but say episcopalians,because this one does not agree with you.PRES,TRUMP is right.my family came here and did it the right way,the law is the lay ,and i an not alone on this . i am 71,a vet who fought to keep us safe and free. Fools. DACA is at great risk of being repealed by the Federal Courts. If that happens Dreamers are at risk of immediate deportation. Trump bought them a minimum of 6 months, actually most can renew the work for another 2 years. I am in favor of Congress fixing the Dreamer’s plight. All your shrill left wing babel turn me off. You can get all blue states Congressman vote an die in the Senate. Short of 60 votes. Fools! Yes and I am saddened by the rhetoric of you psuedo-Christian right-wing religionists. Looking at the comments above, I am saddened that there is so little room for God’s grace to enter in. Whatever your opinion of DACA, justified or not, these were small children who were not in control of their lives. To have them face deportment, after believing that there was a legitimate path to citizenship, is an abrogation of our country’s honor. What is legal may not be moral / ethical. Those who grew up in developing countries are of the opinion that US besides being a moral / ethical country is also a generous country. No one hears of people from developing countries trying to flee to Russia or China or ??? I will bet that with the exceptions of a handful, the majority of the immigrants (some illegal) work hard to better their families and contribute to society via taxes and volunteer activities. For legal issues, they look to Congress; for moral / ethical support, the various churches. The Episcopal Church is no exception. I sincerely hope that both the Congress and the Episcopal Church are on the right side of history. You shall not wrong or oppress a resident alien, for you were aliens in the land of Egypt. When you beat your olive trees, do not strip what is left; it shall be for the alien, the orphan, and the widow. When you gather the grapes of your vineyard, do not glean what is left; it shall be for the alien, the orphan, and the widow. ENS is showing too much of a template for stories these days, meaning an obvious leaning to what the liberals and anarchists are calling “The Resistance”. Start with your headline: “Episcopalians say Trump’s DACA decision is not the last word”. That is a loaded headline with the natural conclusion that the President is somehow a villain and that eruptions of deportations will occur. The headline could have easily have been: “Trump Calls on Congress to Fix DACA”, “Trump Protects DACA Children From a Legal Peril – Calls on Congress to Enact a Durable Law”. Back to your headline. While Episcopalians can say that Trump’s DACA decision is not the last word, the President himself beat them to it. Mr. Trump wants a durable law to create a permanent fix to a sketchy and problematic Executive Order. Enough of governing by emotion. Follow the Constitution. The legislature has responsibility to create laws, and executive orders are not laws. They are temporary dictates, and sometimes overreaches to satisfy the political base. The President is calling on Congress to follow the Constitution and create a law to compassionately address DACA concerns without opening floodgates for abuse. They have 6 months. If anything, today’s political activists should learn a new way to dialog. Start with education about the law of the land that you say is dear and learn that we are a Constitutional Republic and not governed by howling mobs accusing others with signs and shouts. Alienating and vilifying lawmakers is a cheap stunt at best and does absolutely nothing to advance a cause. That’s why more lawmakers are not holding town hall meetings. It has been discovered that there are organized interruptions planned at many of these events because dialog and understanding is not the goal of The Resistance. America is largely tired of the media-ready protests. It has become a daily noise, full of sound of fury, signifying nothing (to borrow from Macbeth). Oh please! Obama pardoned trators and criminals and your leftist media said nothing. Where’s your outrage about that? Charles Paul, I am equally saddened by the rhetoric of psuedo-Christian left-wing religionists like yourself. Terry, Me too. I am saddened by the Episcopal Church as a whole. From the bullying of Texas over their proposed bathroom policy, the removal of historical stained glass in churches including the National Cathedral to the advocation and encouragement for breaking immagration laws the Episcopal Church has become a Progressive Leftist lobbying organization. Bill, I could not agree more. And the thing that really angers and frustrates me is how church ‘leaders” totally ignor the concerns of people like you and me in regards to the examples you mentioned as well as many others. Their response is total silence, and that pretty much tells you how unimportant our opinions are to them.